A couple of hours after we failed to get some charcoal toast sandwiches for breakfast and had to settle for some pasteis de nata from Margaret's Café e Nata, it was time to check out of the Hard Rock Hotel Macau and head next door for lunch. We were very kindly offered the omakase lunch so that we could sample a wider range of Chef Osumi Toru's repertoire. So glad that we decided to have a light breakfast! 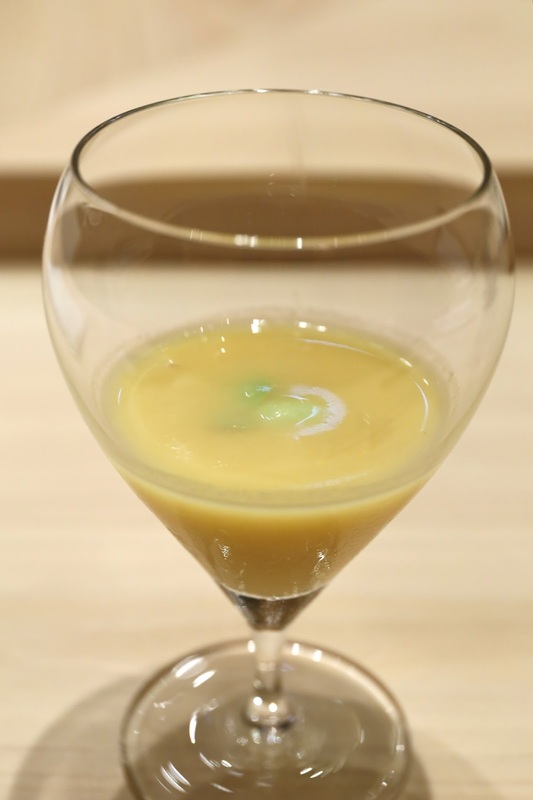 Corn soup (とうもろこしのすり流し) - made with dashi (鰹だし) and garnished with a couple of green soybeans (枝豆). A nice and refreshing start. Rosy seabass (喉黒) - lightly torched (炙り). Japanese horse hair crab (毛蟹) - covered in a layer of yuba (湯葉), served with a ponzu (ポン酢) jelly, and garnished with a dab of crab tomalley (蟹味噌) and minced ginger on top. Very nice. It was at this point that I saw Osumi-san pull out the box of tuna, and realized that when asked about our dietary preferences at the start of the meal, the only thing I offered up was cod milt (白子) - which can't be imported into Macau anyway. At a sushiya of this caliber, I would expect that the tuna being served to be bluefin, and that would be off limits for me. So I apologized to Osumi-san and asked for substitutes... I could see that he was caught off guard, and maybe a little perturbed, but I hope he eventually forgave me. Glass shrimp (白海老) - my first substitute. Garnished with a dollop of marinated bonito guts (鰹酒盗), as well as perilla (紫蘇) leaf chiffonade. Pacific saury (秋刀魚) - lightly torched. Love that tasty fish oil. Pickled mustard (榨菜) - a little surprised to find a Japanese chef serving this as a palate-cleanser... especially since it's kinda spicy. Fat greenling tempura (鮎並 天婦羅) - topped with a tomato tempura, and perilla chiffonade. The acidity here cut down the oiliness of the tempura. Geoduck (海松貝) - crunchy as expected. Japanese hairtail (太刀魚) - lightly torched but still very tender, although the skin was rather crunchy. Served with minced spring onion (葱おろし) and dressed with a little yuzu (柚子). Octopus (鮹) - slow-cooked and very tender. Tilefish (甘鯛) - nicely grilled. Served with some sweet white miso on the side in addition to the lime. Squid (烏賊) - with a little sudachi (酢橘). Splendid alfonsino (金目鯛) - nicely torched on the skin side. I love this fish... especially when you melt the fat a little with some heat. Baby seabream (春子鯛) - only around 6 months old. This was marinated much in the same way that chefs marinate gizzard shad (小鰭). Horse mackerel (鯵) - a beautiful, fatty piece. With some perilla in between the shari (しゃり) and neta (ねた), and topped with some asatsuki (浅葱). Gizzard shad (小鰭) - I've never had it served quite like this before... just one single stroke splitting it in half. Love the vinegar marinade. Japanese green sea urchin (馬糞雲丹) - from Rishiri (利尻). Clam (蛤) - not quite drenched in the sweet sauce the way Jiro does it, but still a little sweet. A little yuzu. Conger eel (穴子) - grilled and lathered in sauce, with a sprinkle of sansho pepper (山椒). Ark shell mantle roll (赤貝のひも巻き) - Osumi-san makes some interesting rolls, and for me he used the mantle of ark shells together with cucumber - instead of tuna. Pretty cool. In terms of sushi, it was interesting to find there was enough vinegar in the rice to be noticeable, without being in-your-face the way Jiro does it. The rice grains were actually a little harder than I expected, which isn't the norm in this part of the world. My only complaint is that I felt Osumi-san sometimes didn't pack the rice grains tightly enough, and on a couple of occasions, the shari fell apart as I picked the pieces up with my fingers. Egg (卵) - this was a lot creamier and mushier than most versions I've had -almost like a cheesecake. Later I realized that this was also the style at the Kanesaka honten. The dessert was a combination of fruits and sweets. A chunk of Miyazaki mango and a chunk of Melox (メロックス) melon from Shizuoka sat underneath some sake ice cream, which came with some peach coulis and... yup... gold foil. Besides the single Kyoho (巨峰) grape was a citrus wedge. 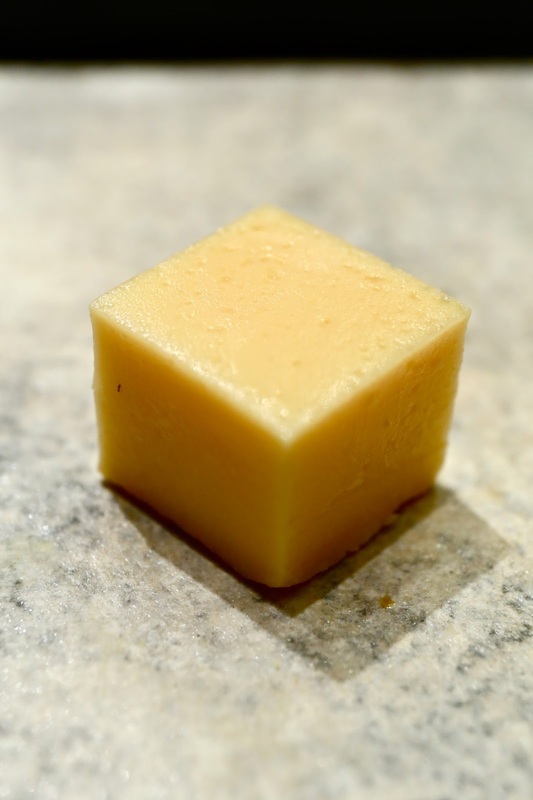 This would be a jelly made with hyuganatsu (日向夏) citrus, with chunks of the flesh inside. Our last nibble would be some dorayaki (どら焼き) - Doraemon (ドラえもん)'s favorite. This was a very good meal... and certainly a lot to take in for lunch! I had high expectations coming in, and I took note of the creativity Osumi-san brought with him. Unfortunately we had to make a run to the ferry terminal so that I could get back to Hong Kong for a long-awaited dinner, which cut down on the time I was able to spend chatting with the chef. Many thanks to the PR team at the City of Dreams for treating us to so much good food over the weekend!